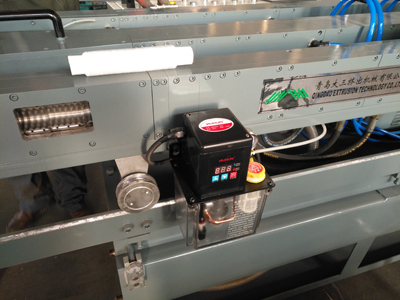 This technology consist of blowing low pressure (0,1-1,5 bar) through the die head spider into the center of the continuously extruded hot plastic tube. The air is retained by a plug with metallic or silicone washers. The hot plastic material is expanded by the internal air pressure against the corrugation machined in the mould blocks which chill and holds the tube against the moulds to provide the desired geometry. Corrugated products formed by internal air must have constant I.D. dimension. This technology consists of pulling the hot plastic tube against the mould blocks by vacuum suction applied through the moulds applied to the plastic tube outside diameter surface. Vacuum from the moulds keep the tube against the moulds to provide the desired geometry. Corrugated products formed by vacuum may have variable I.D. dimensions.